UP TO 120H PLAYTIMES:Absolute true 3000mAh High capacity charging case support 30 times fully charging for the wireless earbuds, also work as an power bank to charge your phone. Bluetooth headset lasts for 3-4 hours on every single charge, so totally 90-120 hours play times, 360 hours standby times. TRUE BLUTOOTH 5.0: Newest Bluetooth 5.0: powerful in achieving more stable transmission with very low power consumption, greatly prolonging the distance of signal transmission(40m barrier-free) and the leapfrogging of transmission speed. T8 true wireless headphones is widely compatible with iPhone 6,7,8 Plus, X; Xs, Android, samsung phones, iPad, etc. 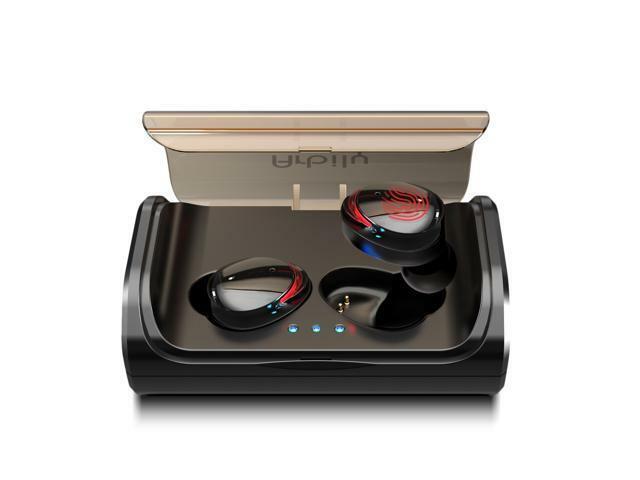 UNCOMPROMISING SOUND QUALITY:HolyHigh T8 best wireless earbuds take the lead in adopting the composite diaphragm-effectively reduce the sound rendering and distortion, higher compatibility, show powerful bass. 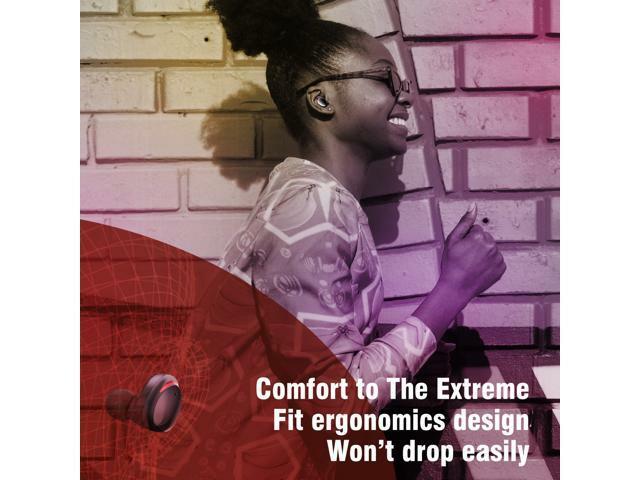 After hundred of tests by professional acoustic engineers, become a superior wireless earbuds for different types of music. 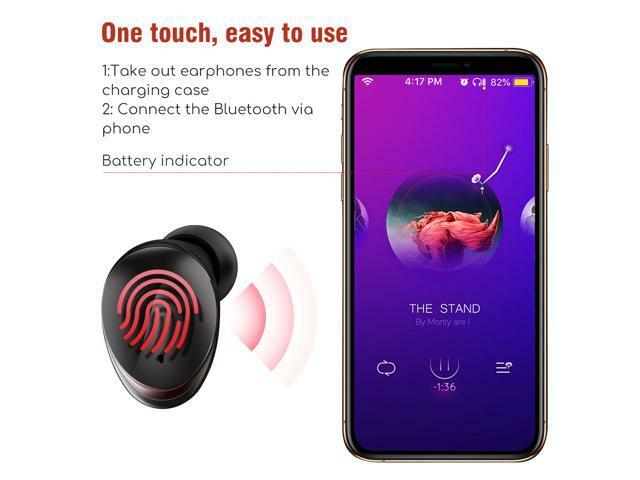 THE MOST ADVANCED 3000 mAh Charging Case High capacity portable charging case support 30 times fully charging for the wireless earbuds, also work as an emergency power bank to charge your Phone. 50 mAh capacity wireless earpieces last for 3-4 hours on every single charge, so total timeout to 90-120 hours play times, 360 hours standby times. This is equivalent that T8 true wireless earbuds can accompany with you 6 times flying from Singapore to New York - The longest flight in the world. 1. Please plug the charging case into a USB power supply(5V1A) with the attached USB cable or it will do harm to the charging case resulting in the charging problem. 2. 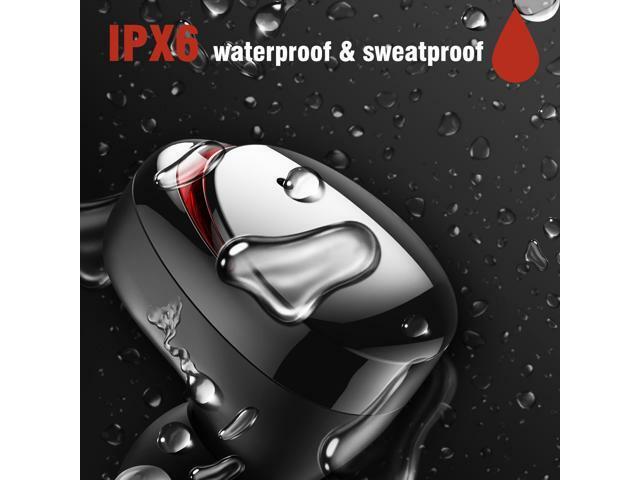 Because the earbuds are charged though metal contact plate in the charging case, sweat will corrode the metal contact plate resulting in the charging problem.Therefore, it is recommended that use a dry rag to clean the sweat on the metal contacts. 3. If the charging case is in low battery, it would turn hot when to be used in charging smart phones. 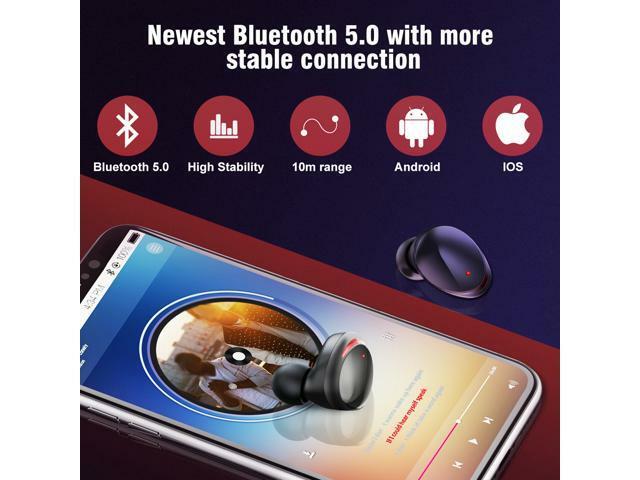 Comparing to Bluetooth 4.2, Bluetooth 5.0 is powerful in achieving more stable transmission with very low power consumption, greatly prolonging the distance of signal transmission and the leapfrogging of transmission speed. 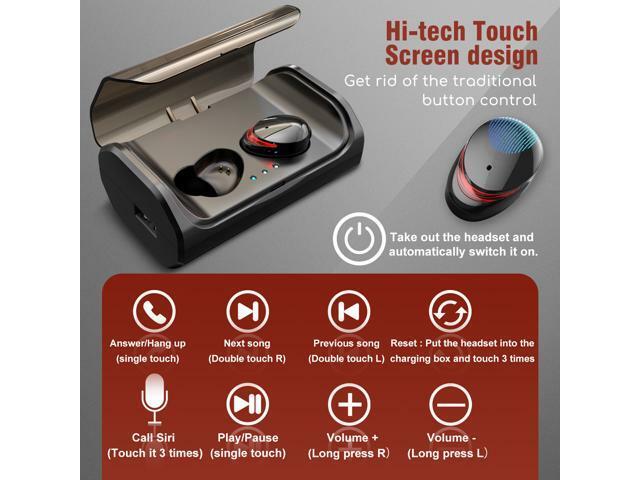 All in one button, 3D fingerprint sensitive touch panel allow you to turn on/off, play/pause music, answer/reject calls, and activate Siri voice assistant. Widely compatible with iPhone 6,7,8 Plus, X; Xs, Android, iPad,laptop, Fire Tablet, etc. HolyHigh T8 take the lead in adopting the composite diaphragm--effectively reduce the sound rendering and distortion, higher compatibility, show powerful bass. After hundred of tests by professional acoustic engineers, T8 true wireless headphone focus on well-balenced highs, crisp mids, become a superior wireless earbuds for different types of music. 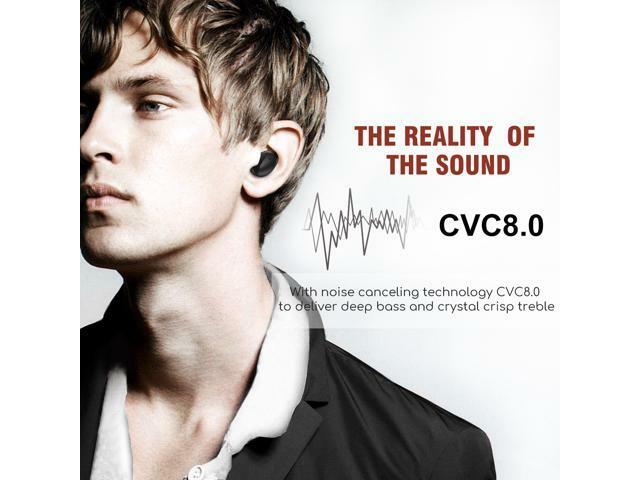 Newest CVC 8.0 Noise cancellation reduces 75% of low-frequency noise and echo, enable clear sound no matter in calls or when listening to music. T8 Bluetooth headphones liberate you from the complicated pairing. Only pull the L and R earbud out of charging box and they will pair with each other, then "T8" automatically appear on your smart phone Bluetooth list. T8 bluetooth headphones support working with 2 devices separately in mono mode, or use together as a pair in stereo mode. The latest Bluetooth 5.0 allows this earphone to have binaural call with built-in microphone.